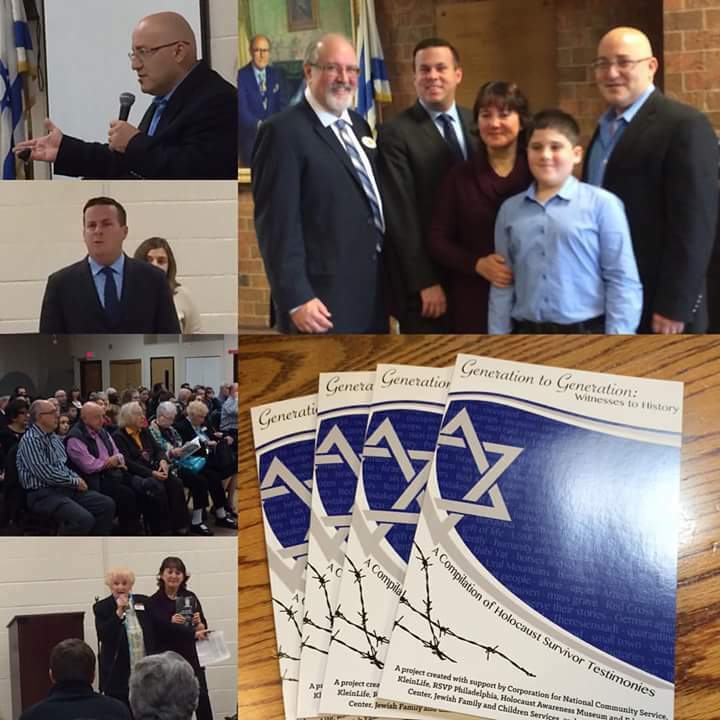 The Generation to Generation books pictured were presented to student and Holocaust Survivor participants on Sunday, October 18. The event was the culmination of a two year project by which teen volunteers interviewed Holocaust survivors primarily from Russia. Those interviews were the basis of essays retelling each survival story to preserve it and make it accessible to future generations of students. Copies of the books were presented to these students, the schools attended by the student participants and the survivors who were interviewed. A complete copy of the book will be available on the HAMEC Web site. Except these aren’t ordinary “chaim” we’re talking about. These are the lives of 30 men and women who managed to survive a different circle of the Holocaust from what is usually portrayed. The book recounts their stories, delivered in vivid, painful detail, not so much of what it was like at Auschwitz or Dachau, but in work camps in the former Soviet Union or the Ukraine. What makes this work stand out is that it functions as a generational oral history: their stories as told to their grandchildren, great-grandchildren or others not much older than they were when their lives were turned upside down in a way none of us can imagine. Just as we’ve become duty-bound every year to tell the story of Moses leading his people out of Egypt to the Promised Land, this is their modern day pass-over. Those who survived it can only hope and pray through their accounts we’ll never forget and pass it on, too. president, before an Oct. 18 presentation, where many of the survivors in the book and the children who chronicled their revelations were in attendance. “Who would be better to tell their stories than our children who don’t know much about the Holocaust? The project originated with a call from the White House, which had been directed to KleinLife by a local division of the Corporation for National Community Service in Washington. After the White House expressed interest in a program to promote Holocaust awareness and committing $50,000 in federal funding, a joint effort between Kleinlife and the Philadelphia Holocaust Awareness Museum — located in the KleinLife building — came up with the idea for a book. When the call went out for survivors to come forward, it got confusing. Many people who endured hardships like Krug’s grandmother don’t consider themselves “survivors” on the level of those with numbers tattooed on their arms. It’s a responsibility probably none of the young chroniclers fully appreciated when the project began. “He told me about his life in detail,” said 15-year-old Council Rock South student Alyssa Shargarodsky, of Mikhail Tzipis, whom she had to interview in Russian over the phone rather than in person. “It was a lot more than I ever read about. I knew how harsh things were, but the way he was describing the death of his family and how hard it was to move from one place to another and feel safe, that kind of overwhelmed me. Nor did her classmate Steven Vishnevetsky expect quite the outpouring of emotion from Morris Shenberger, who died just before the book was published. “He emphasized the fact he was so stressed by war and was desperately longing for peace,” said Vishnevetsky, who also — like most of those involved in the project — conducted his interview in Russian. “I had relatives who were in concentration camps. By the same token, the survivors, whose ranks dwindle daily — considering it’s now 70 years since end of the Holocaust — feel their own sense of obligation. “It’s impossible to overstate the importance of this project,” said Inna Shvets, editor of the Philadelphia Russian-language newspaper, Jewish Life, who was in Moscow when the Germans invaded in 1941. Like her, they all have stories to tell. And now that they’ve been able to tell them, people will know what horrors they endured. It’s one thing for Jews to listen. But by sending them out into the non-Jewish world, hopefully others can learn. “I think the Holocaust was touched upon but it was sort of just mentioned,” said State Representative Kevin Boyle, who’s played an active part — along with his brother, Congressman Brendan Boyle — in trying to make teaching about the Holocaust mandatory in Pennsylvania schools. Change won’t come overnight, even though Holocaust Awareness Museum president Chuck Feldman says they’re constantly reaching out to the non-Jewish world. He hopes if they can hear from people like Sara Weingram, it will sink in.